On 17 January 2001, the Philippines witnessed the Second EDSA Revolution (EDSA II). The EDSA II, also known as the People Power II revolution, was a four-day political protest ending on 20 January 2001, that protest peacefully overthrew the government of Joseph Estrada, the thirteenth President of the Philippines. The main weapon of that revolution? The cell-phone. Julius Court, who in 2001 was a Programme Officer at the United Nations University and co-director of the World Governance Survey project, said that it was the use of cell-phones for “texting” rather than calls that was the most intriguing part of People Power II, and was also the key to its success. “The lack of attention to the role of technology is surprising. People Power II was arguably the world’s first ‘E-revolution’ - a change of government brought about by new forms of Information and Communication Technologies,” he said. While applications such as WhatsApp, Line, and WeChat (to name a few) have taken the place of “texting”, the principles remain the same. It has become more than just about communicating with an acquaintance, friend, or family member, it has instead become about communicating with the world. Today, social media is playing the continuing-role of watchdog in politics, the formation of policies, and even human rights. Governments need to be especially aware as whatever is happening in their respective backyards is probably known by most people in ASEAN - one of the fastest growing regions for social media usage. According to a report from Google and Temasek, the region is poised to reach 480 million internet users by 2020, with smartphones users making up roughly 90 percent of this number. But more than this, the report also found that on average, consumers in Southeast Asia spend 3.6 hours per day on mobile internet. Thais though spend 4.2 hours per day on mobile internet. For context, consumers in the United States (US) spend an average of just two hours per day on mobile internet. 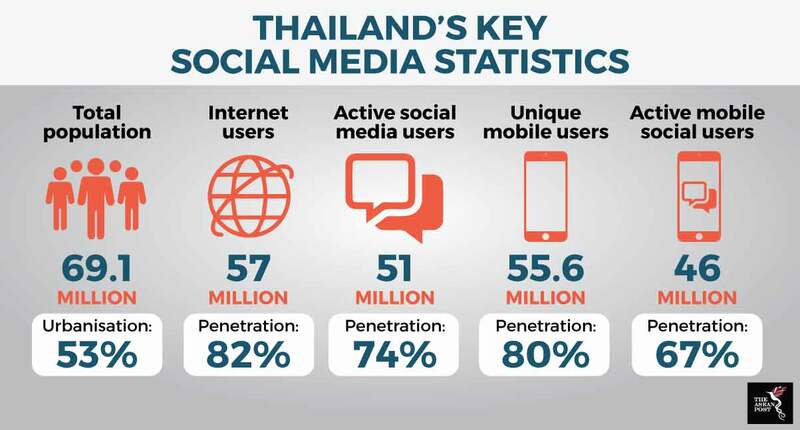 Statistics from We Are Social’s 2018 report also show that Thailand’s social media penetration is strong. According to the report, out of a population of 69.1 million, 57 million are internet users, 51 million are active social media users, 55.6 million are unique mobile users, and 46 million are active mobile social media users. Of the many social media platforms available, Twitter has gained more prominence in Thailand especially after the case where an 18-year-old Saudi Arabian teenager was granted asylum when her tweets went viral after she was detained in Thailand. She was stopped while fleeing from her family in Saudi Arabia en route to seeking asylum in Australia. The Australian government has revealed that it intends to offer Rahaf Mohammed Mutlaq al-Qunun asylum if her case is found to be genuine by the UNHCR. Qunun had initially barricaded herself in a hotel in Thailand after she was detained. In a series of tweets, she claimed she was abducted and had her passport taken from her by Saudi Arabian diplomatic staff after she arrived at Bangkok’s Suvarnabhumi Airport. It was at this point she barricaded herself in her hotel room out of fear that Thai immigration officials would send her home. In the end, it was Canada that took Qunun in but not before her case placed Thailand in the international spotlight; highlighting the ASEAN nation as a country that does not recognise asylum seekers. Later, Thailand’s immigration chief vowed in future not to force refugees to return home “involuntarily”. But Thailand isn’t the only place where social media has played a role in changing policy. Malaysia’s landmark election on 9 May 2018 saw the National Front (Barisan Nasional) lose its grip on power for the first time in 60 years. The media – both foreign and local – were abuzz with news of the defeat at the hands of the Alliance of Hope (Pakatan Harapan) coalition and among those reports were numerous analysts who claimed the victory came about as a result of social media. Today, social media is still being used to keep a watchful eye on Malaysia’s new government. Both these cases are examples of how the global community is constantly kept in the know about the latest happenings in any given country through the aid of social media. Thanks to social media, the world today is a more open place with information readily accessible to all.